Contacts are placed onto a list by you and can only be removed if you manually remove them, or if they unsubscribe from your emails. 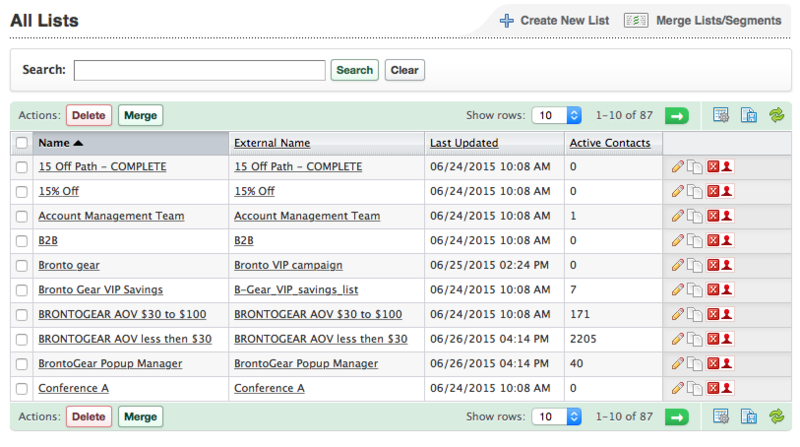 The All Lists page lets you see all of the lists that you have created in your account. From this page, you can begin creating new lists, or manage existing lists. On this page you can see the internal name for the list, the external name that customers will see if you use the list in a webform, the number of active contacts you have in a list, and when the details for the list were last updated. Contact imports where the contacts are added to a list. Copying a segment to a list. Merging lists together. This only updates the Active Contacts for the merged list. Splitting a list. This updates the Active Contacts for both of the lists that resulted from the split. Direct import to a list. This is also true for anywhere else in the platform you see a number of contacts associated with a list. It is also important to note, the Last Updated date reflects when one of the details for a list - Internal Name, External Name, or Active Contacts - was last updated. So, if you add contacts to a list but this does not trigger the Active Contacts number to increment, the Last Updated date will also not change until the Active Contacts number increases during the next nightly calculation. Merging lists and/or segments together allows you to create a new list that is a combination of the lists or segments you merged together. Splitting a list allows you to take an existing list and split it into smaller chunks (split groups). For example, you could take a list of 100k contacts and split into three sub-lists each containing a percentage of the original list (ListA: 50%, ListB 25%, and ListC 25%). Contacts from the original list will be randomly distributed onto the split groups. List labels can be used to organize and visually group lists.